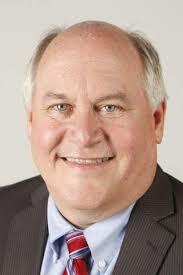 Maybe Republican Ron Estes, Kansas state treasurer, will win the special election today in the 4th Congressional District to replace Mike Pompeo (who's become Trump's CIA director), and maybe not. The Republican National Committee is suddenly pumping all kinds of money into southern Kansas to try to save Estes. His Democratic opponent, James Thompson, is just a whisker behind him in some polls. In other polls, he's a whisker ahead. According to David Weigel, "Estes rarely mentions Trump," and that alone tells us a great deal about Republican panic in this year of His Orangeness. Every special election this year for Republican Congressional seats -- and there are about to be four of those, starting with the Kansas 4th District -- is going to be a virtual referendum on Trump. Among other things hurting Estes, despite his rugged good looks, is the deeply unpopular Republican Governor Sam Brownback, polling below 25%. That's gotta hurt Republican turn-out. Even if Thompson loses, the near-death experience for Estes might provide a sobering prophecy for Republicans who allowed Trumpism to take them over. Well, your man came in second anyhow. That's pretty good. Don't You Even Look at Him, You Peasants!